It says a lot when the first sentence of the dissertation’s abstract starts with “four visits”, and in fact, Lopéz-Otríz did not study seabird foraging and feeding habits, per se. He collected regurgitations during just four (4) site visits to Monito in 2003 – during the nights of June 26, August 30, September 30 and October 28 only. This is too few visits to adequately assess breeding success or total nesting population size. 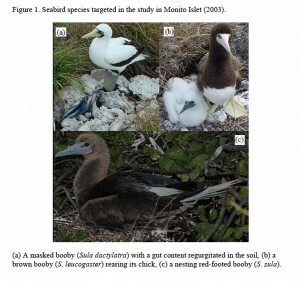 No more than 15 samples per visit were collected per species for the 3 species of boobies (a total of 48-53 samples per species). Samples were picked up from the ground and there is no information as to whether the samples came from chicks or adults. This is important because the diets of adults, and what they feed to their chicks can be different; and the diet of pre-breeding and incubating adults also can be different from that of chick-rearing adults. The study ignores much highly relevant work done elsewhere, including a large body of work with other tropical species at Culebra during the 1980s and early 1990s. Each page of the dissertation has the heading “Ricardo López-Ortiz, 2007…” yet the dissertation signature page has the date “2009”, presumably the year of graduation. It is already well-established in the literature that seabirds compete with fishers, fishes, and other marine species for a number of their target preys, and thus must be factored into the management equation, -if one wishes to maintain the seabird wildlife resource. However, Cury and Lopez-Ortiz are worlds apart in approach and scope. Thank you for contributing your valuable opinion on this topic. We appreciate your comments and hope that others will consider your analysis when assessing studies similar to this one. Your point is well taken. Perhaps the announcement of the post exaggerated the contribution of Lopez’s dissertation. The objective of the blog is to underscore important publications and ideas (from the region, and globally), germane to the conservation of marine and coastal resources, and to connect them, and make them available to our managers, scientists and the public. Indeed, Cury et al. superb comparative and statistical analysis could serve as a template for future research in our region. Thanks for your comments and detailed look at those publications. My greetings to Jasmine, Fred and his wife Dr. Janice Gonzalez, and a hug for Manolo. This is the first time I enter a blog and I find fascinating its use to raise ideas as potential targets, which may provide direction to scientific issues as important as the use and conservation of natural resources. The objective of the blog, as presented by Manolo, is of most interest to me. However, I will put a few words together in relation to Fred’s comments, which I believe could clarify some of his points for the benefit of the students interested in the study of marine birds. Although not with the same approach, I agree with Fred. It is simply expected that the two studies discussed were very different. I read the excellent work of Cury and colleagues (2011). Cury and colleagues among several methods, use the meta-analysis approach or “analysis of analysis” to reach their conclusions. Usually this method does not require field sampling and what that entails, so that the logistics and difficulties are of different natures. The method of meta-analysis aims to develop a new perspective based on the analysis of the accumulation of data from several independent works. Another big difference is that this study analyzes the results of several studies located in waters rich in nutrients which, unlike the Caribbean waters, usually abound low trophic level species such as sardines. Consequently, most studies in these waters are conducted through fishery industries (e.g. tuna and sardines) in partnership with universities and governments. In the Caribbean, where the waters are considered low in nutrients, there is no fishing industry as such, and it is my understanding that “competition” between seabirds and the traditional, sport fishery and commercial fisheries together never will come close to what is documented on the industrial fisheries at the locations analyzed by Cury and colleagues. Finally, the bird species analyzed were also different. On the other hand, every job has its merit and appropriate niche in the study of the relationship between global and local fisheries and conservation of seabirds. This is the foundation of the blog theme, one that provides the opportunity to be proactive and rethink or suggest new ideas. In my view, on nutrient-poor marine waters there are not enough published studies to produce a meta-analysis such as that produced by Cury and colleagues, much less in the Caribbean, and perhaps this is the most relevant issue. So the study of Cury does emphasize the need to continue to evaluate bird populations and their prey; matter to be applied to the Caribbean. A start would be to assess those gray works such as progress reports from government agencies, universities, etc. Not forgetting that as one of the north is to eventually achieve a similar meta-analysis. This requires a coordination center that could be Sea Grant. This center could identify sources of funding and coordinate efforts to identify the variables needed for the meta-analysis, the short-and long-term goals, data sources (DNER, FWS, UPR, Cuba, Dominican Republic, Guadeloupe, etc. ), and so on. Finally, during these days I got an email about the creation of the American Fisheries Society Chapter of Puerto Rico. Those interested should contact Lourdes Olmeda in the DNER (787-999-2200). Good day for all folks, and success with the good work.